Planning a family trip to Russia? A couple of days sightseeing in Moscow followed by a trip to Terskol to see the mountains? Don’t forget to wrap up warm! It might be -10°C but your kids will happy exploring their surroundings in the COOK JACKET. This jacket will keep them warm even in Siberian temperatures. The jacket has a warm duck down fill. The box-wall fill chamber construction gives the down plenty of room to achieve its full loft and ensures optimal insulation performance. The windproof outer fabric adds an extra layer of defence when your kids are out in stormy weather. The fabric is also water resistant. So it’s happy faces all round, even in miserable weather conditions. Elasticated cuffs seal the sleeves and stop the cold wind creeping in. The shoulders, lower arms and back are reinforced with TEXAPORE OTTOMAN TASLAN – a very robust fabric that’s built to cope with the harsh treatment dished out by little outdoor adventurers. 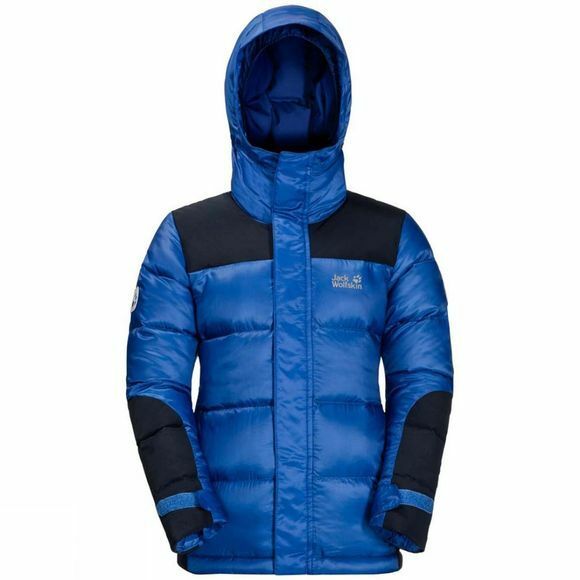 The jacket has a deep hood for better protection from the elements and a MICROGUARD MAXLOFT synthetic fibre fill for warmth.